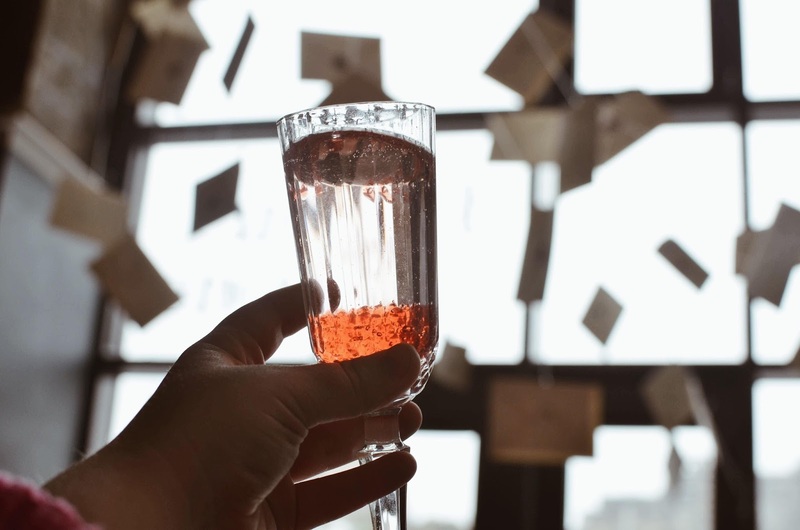 While I'm usually all about the food on this blog, today I'm talking about two of my other true loves in life: Harry Potter and booze. 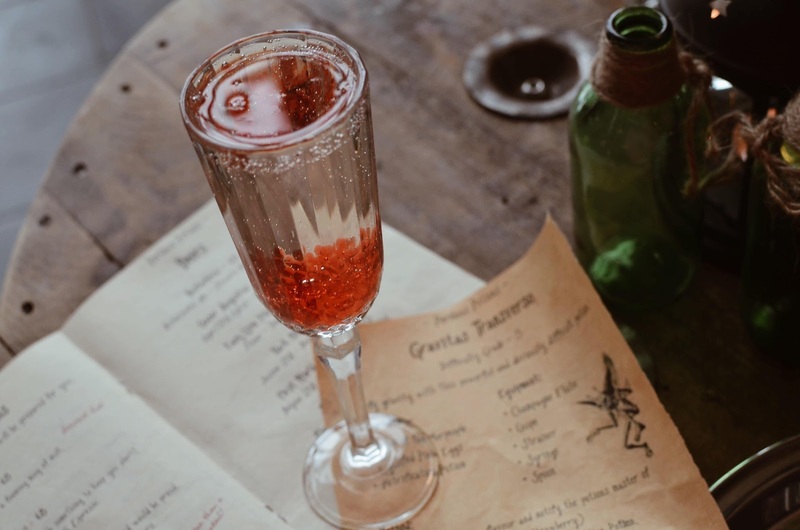 Last week during the absolute blizzard that was the Beast from the East, I decided the best way to keep warm was to get day drunk, so I headed off to the Pop Up Geeks' latest venture Perilous Potions, a Harry Potter themed pop-up bar. Now I have to be completely honest, I was a little apprehensive about checking out this pop-up because I was quite disappointed by their Game of Thrones bar back in January 2017. It was insanely busy and it really didn't feel like that much effort went into it. It was just a couple banners and TVs playing repeats of the show. There were themed drinks but it wasn't anything really exciting. With any themed bar, I'd expect there to be tons of things around to take photos of or photos with, but there wasn't really much. When I was there I never saw the Hodor door so it either came about after I visited or I just never saw it. They also had like a sword and shield behind the bar, but it was just behind the bar so there was no photo opportunity. I personally like themes that are interactive, because what's the point of bringing to life a fictional world if you don't really get to feel like you're part of it? So from my last experience, I did not have the highest expectations for Perilous Potions. But spoiler alert! This pop up got an E from me (Exceeds Expectations). A lot of effort and detail went into the décor of the Pop Up Geeks' new permanent location in the Arches. From the moment you walk in you get a taste of the Harry Potter magic with Hogwarts letters and brooms flying above your head. You're even greeted by a barman in robes who seats you at your table. The fact that you have to book a table is one way in which this pop-up works far better than the Game of Thrones, it means you can enjoy it without being packed in like sardines! You're then given a potions school book that has the bar menu inside. 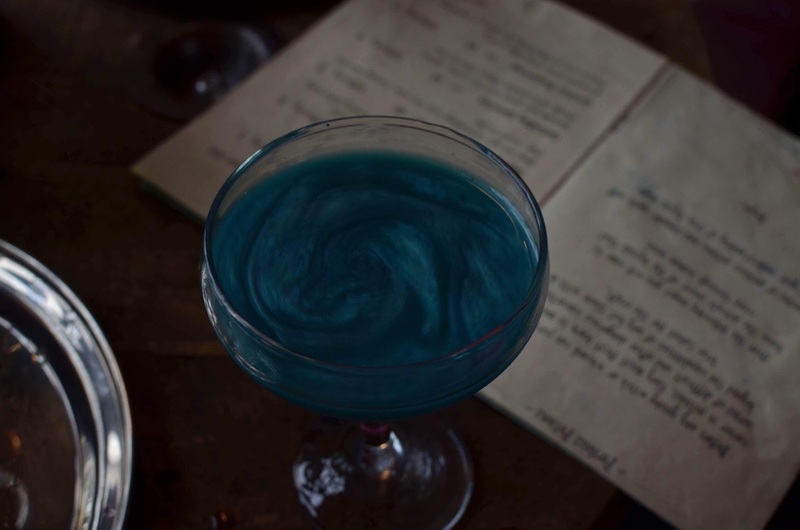 The menu features the main event the 'perilous potions' which are cocktails you make yourself alongside made for you cocktails and other drinks. Being the wizard I am, I of course only opted for the potions. Each potion comes to you on a tray with instructions on rolled-up piece of parchment. The potions range in difficulty from Hufflepuff to Slytherin (just kidding it's actually just 1 to 5). With 1 being the easiest and most straight forward to 5 being the more complex cocktails. 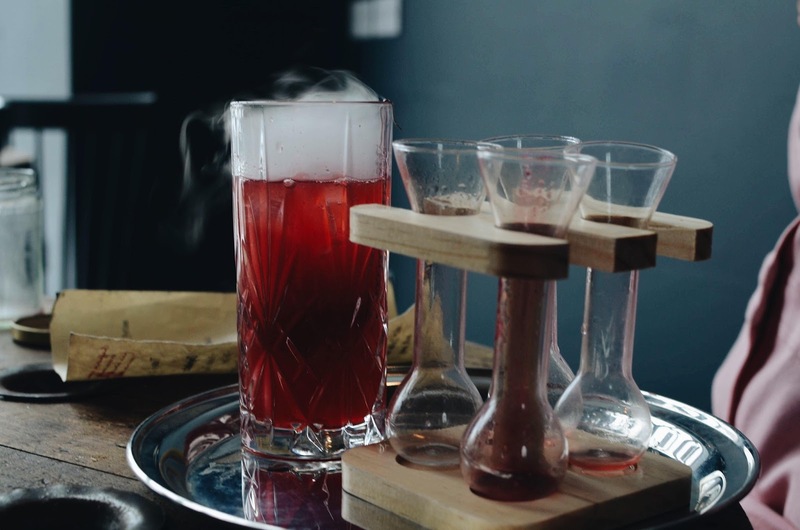 My friend and I tried cocktails from almost every level and I felt they were all challenging enough to be quite fun but still easy enough to get right. The most difficult, aka the one at level 5, wasn't too much harder than any of the others, it just took longer and a bit more concentration. There was a lot of variety in the way in which you made the cocktails, it wasn't all just dry ice! There was one in which we made jelly bubbles, one that kept moving around inside your glass, one that completely transformed in colour. Plus, they all actually tasted really good. I won't be too much of a Slytherin and spoil how the potions were made though, you'll have to go try them out yourselves! A few people have said to me that they liked the pop-up but found it a bit expensive, I personally think it's quite reasonably priced for the experience you get. The potions are £8 each which, in my opinion, is pretty standard in Edinburgh except for at a Spoons. Plus, it may have just been because it was half 2 in the afternoon, but I was pretty tipsy after the two cocktails I drank! It's not somewhere I'd spend all night drinking in, but you have a 2 hour time slot which is plenty of time to have a bit of fun and maybe get a little tipsy. Overall, I really enjoyed my experience at Perilous Potion, it's complete fan-service and I was living for it. I finally got to be the Slytherin I am in my heart. I'd highly recommend any Harry Potter fan checks it out no matter what level of fan you are, even Muggles can make potions! 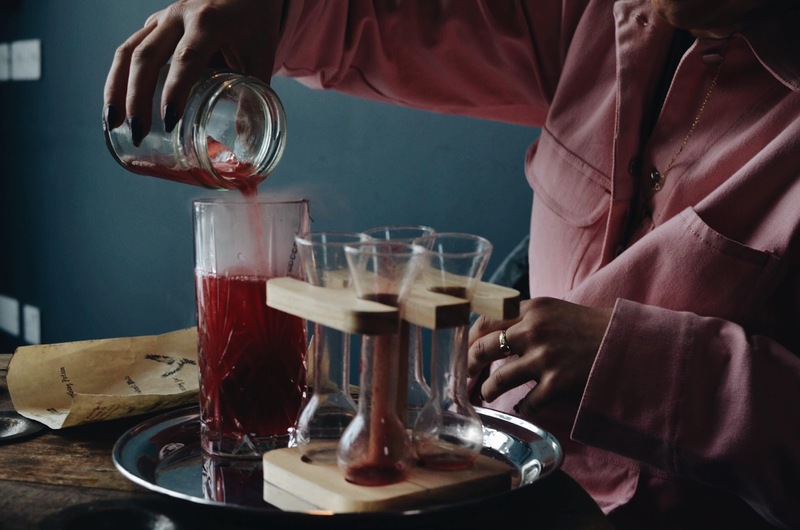 Check out the Pop Up Geeks' website to book into Perilous Potions for yourself – the experience is only on until April 30th!